I remember a conversation when first getting started with Hot Rods mentioning to a friend that I was intending to build my own chassis / frame for my Hot Rod many years ago. His response was, “You can’t do that”. I thought why not, how silly. Having built antique reproduction furniture, renovating several homes, designing and building just about anything and everything has been a big part of my life. At the time I thought, “It’s only steel, what’s the problem”. That’s true, with a great deal of care and thought, I did design and build this chassis / frame for my 1929 Ford Roadster hot rod. Not only that, I did it with an independent suspension using C4 Corvette suspension components. I have to admit, it was not easy. Most likely if I used traditional suspension parts for my hot rod, I would be driving the hot rod right now! I never do anything easy, and that’s what makes life interesting. Not only that, learning and doing new things constantly, keeps us young at heart and very healthy. It has been said that if you don’t use it, you loose it. Well, I must say, I am living a dream with every aspect of my life and thoroughly enjoying it. Enough of that, let’s get on with the build process of the 1929 Ford Roadster hot rod chassis / frame. It has been an interesting process designing and building the frame / chassis for the 1929 Ford Roadster hot rod. The chassis I designed and built will work on any 1928 – 31 Ford Model A body. It has a stock wheelbase, widened slightly in the front and narrowed in the rear to fit between the stock body rails of the Model A Ford. This chassis / frame is considerable stronger than the original 1928 – 31 Model A Ford frame. This chassis / frame is intended for a high boy style car which is fender less. I intend to start out fender less, and possibly use rear fenders and a bike style fender on the front of the hot rod in the future. That thought is still up in the air. I do have stock style fenders for the rear made of fibreglass. In order for them to work, I would need to widen them a few inches to match the track width of the C4 Corvette suspension using stock C5 Corvette rims. The bike style fenders in the front shouldn’t be too hard to fabricate. In the mean time, I will let these ideas to work away in my mind and finished the 1929 Ford hot rod chassis / frame. I tend to lay in heavy and deep welds with my Mig welder, and then grind everything reasonably clean and smooth. It takes a bit more time, but the finished product in the end, I feel looks a bit better and more refined. This next part, now only takes a considerable amount of time with a minor cost of fillers, primer, and sealer. The entire chassis / frame was cleaned and smoothed out with body filler. Using a variety of files, scrapers, sanders, and anything else I could find to make the job easier, hours, and hours of time went into making everything on the chassis / frame as smooth as possible. Some people would say why waste any time doing this? Just go out and get some rust paint, a brush, and an hour later call it done. Well, this is my hot rod and I want to build it my way. Many hot rodders get sucked into the thoughts of others and loose sight of what they want to build. Maybe this is why there are so many unfinished hot rods or custom cars. The builder has lost interest mainly because they were building something that somebody else wanted. Remember, it’s your car, and build and finish it the way you want to as long as it will be safe to drive. I do know that if my standard was a bit different, I would be driving the 1929 Ford hot rod now. For me, it doesn’t matter what I build, I like everything to look a certain way, and that takes time. Oh well! 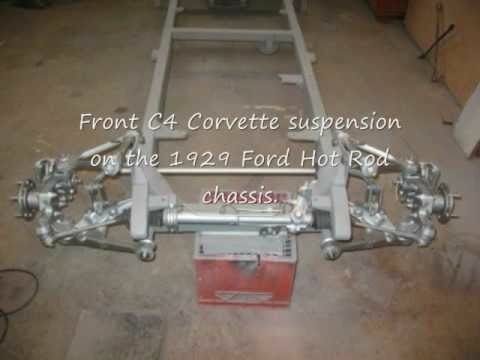 1928 - 31 Model A Ford hot rod frame / chassis using C4 Corvette suspension - the drivers side front is almost all smoothed out. 1928 - 31 Model A Ford hot rod frame / chassis using C4 Corvette suspension - the filling process has started using auto body filler.1928 - 31 Model A Ford hot rod frame / chassis using C4 Corvette suspension - using glazing primer filler putty, thin coats are applied over the primer to fill smaller imperfections. After many hours of smoothing out the body filler, I sprayed my first coat of primer. Sanding now with finer grits of sand paper, a few more imperfections were noticed so out came the glazing putty. The glazing putty is basically a super thick primer and can only be applied in thin coats and then left to cure or dry. Now, there is a bit of a wait game. Often I would go into the shop, apply the glazing putty, and come back the next day to sand and spray another coat of primer. After each coat of primer, I would examine everything on the chassis / frame and make the required touch ups. I didn’t want to rush this process and it took me about a week to get the desired finish before spraying the final coat of primer and sealer. My plan is to get the entire 1929 Ford hot rod assembled and running on the road for a short period of time before the final painting. This will allow me to find and correct any design issues prior to the final finishing and painting of the hot rod. I suspect that when that time comes, I will still go over the chassis / frame one last time to make it look as perfect as possible before spraying the finish coats of paint. Building a hot rod or custom car does take a considerable amount of time and determination. For me, part of the game was to build a very nice hot rod, but cheaply using my acquired skills. So far, this project has not cost me anything but my time. Buying cars, and selling cars / parts has paid for this entire project with money in the bank. Not too bad for such an expensive project sitting in the shop. This was all at the expense of build time on the hot rod. There still will be more information coming on this part of the project but for now the chassis / frame is ready for the C4 Corvette suspension components and get the body on the chassis. Below is a short video / slide show showing some the steps and parts of this very unique chassis / frame for my 1929 Ford Roadster hot rod. Just click on the image below to start the video.